The Viper 640 combines the stiffness of a keel boat with the acceleration and planing abilities of a dinghy, designed by Brian Bennett with the concept of being “Simple, Clean and Effective.” When Rondar Raceboats took over construction, Rondar committed to new molds and applied their high-performance dinghy building experience and skills to a rejuvenated Viper 640. The result: an immensely strong boat that is low weight, affordable, and great fun to sail. 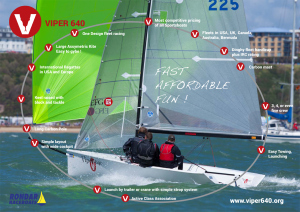 The Viper 640 is a strict one-design class making it ideal for national and international racing, and, as of 2017, the Viper 640 is a recognized World Sailing international class with fleets in North America, Australia, Europe, and now in southern Africa. 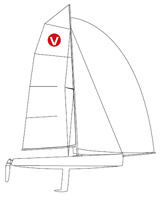 Run out of wind or maneuvering in the harbor or want to race your Viper PHRF? Every Viper is pre-fitted to mount an outboard motor bracket, one of the few “extras” that are available. Alternatively, if you want just to go for a sail, then the Viper offers you the safety and security of a keel boat with high performance. Wide decks and a deep keel ensure comfort and stability in almost all weather conditions. Run out of wind or maneuvering in the harbor? Every Viper is pre-fitted to mount an outboard bracket, one of the few “extras” that are available. 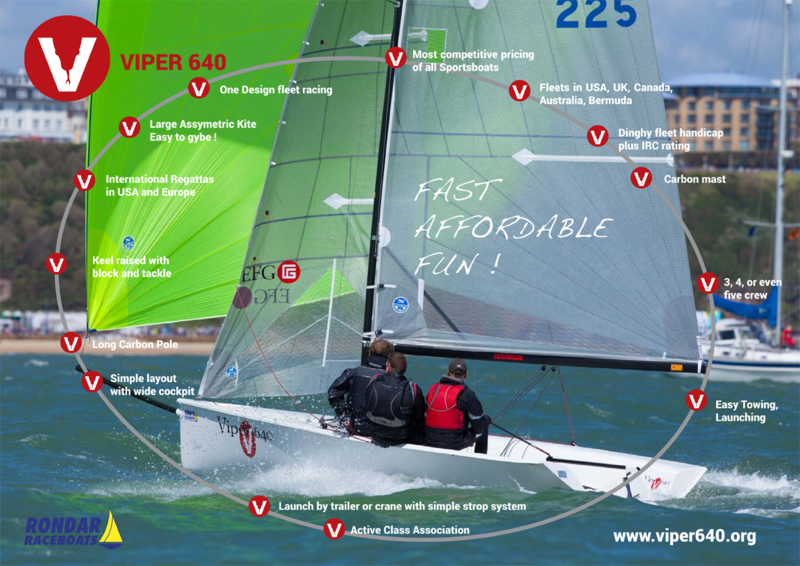 Everything you need to go racing is included in the purchase price of a new Viper 640. Some of the few extras that you might consider are a wind indicator, trailer lighting, outboard bracket, top, bottom and mast covers, GPS or your choice of tactical electronic equipment. The Viper 640 is easy to transport and is simple to launch and recover which makes the boat a winner in the keel boat market. Rigging and launching can easily be done by two. You can tow a Viper with any medium sized car. When unhitched and using the jockey wheel, the Viper weighs 749 lb (340 kg) all up and is easy to maneuver in the boat park or on the road when being towed. The carbon mast can be raised either by a straight lift or by securing the mast heel near the step and hoisting with the spinnaker halyard, secured to the trailer. Once upright, the shrouds and fore stay can be quickly connected. It takes just a few minutes. The two-piece carbon mast is ideal for shipping, storing, or putting inside the boat when trailing. The Viper will float off it galvanized road trailer in about two feet (60 cm) of water. The boat is also fitted with lifting points so that it can be hoist launched with a bridle. It is fast and easy. When in deeper water, the keel is lowered using a supplied block and tackle system and then secured in the ‘down’ position by two bolts.